&hellip What could you possibly do in 1900 to be absolutely sure a night watchman was making his full patrol? 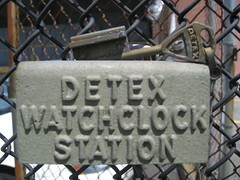 The key, literally, to the watchclock system is that the watchman is required to “clock in” at a series of perhaps a dozen or more checkpoints throughout the premises. Positioned at each checkpoint is a unique, coded key nestled in a little steel box and secured by a small chain. Each keybox is permanently and discreetly installed in strategically-placed nooks and crannies throughout the building, for example in a broom closet or behind a stairway.